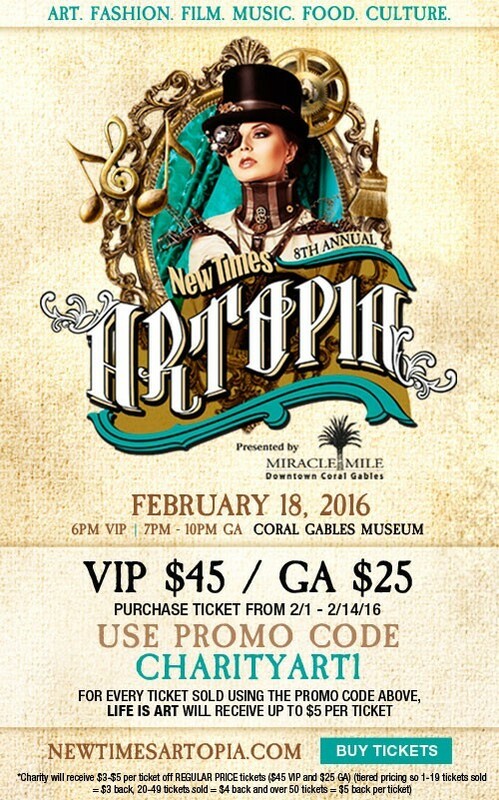 Buy your Artopia tickets with the code CHARITYART1 and a portion is donated to Life Is Art! Life Is Art will receive up to $5 per ticket. This event joins together an eclectic touch of art, culture, fashion, food, music and film. 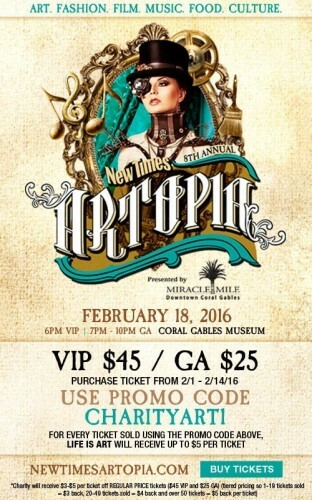 Join us as we celebrate Miami’s best artists, musicians, fashion designers, culinary masters and mixologists. Guests will enjoy complimentary food, wine, GA will have a cash bar and VIP will have a sponsor bar. Entertainment includes musical performances, fashion shows, live performance art and works from local artists. The New Times MasterMind Awards will be announced at Artopia. New Times will award grants to local artists, writers, crafts people or others whose work stands out for its enterprise, creativity and genius.